It’s almost that time of year again. The glitz, the glamour, the multi-million dollar half-time adverts… oh and the Football too. Yes, SuperBowl LIII is upon us. If you are in the UK, you will be able to watch all the action (but not the half-time ads) on BBC TV or the BBC iPlayer for free. But if you are outside of the UK, you will find this service blocked. But don’t worry, with a VPN you will be able to unblock the iPlayer and watch live coverage of SuperBowl LIII no matter where in the world you are. And in this article, we are you tell you exactly how to do it and even recommend the best VPN for the job too. The first thing you will need to do is choose the right VPN for the job. Choosing a VPN can be a little trickier than it sounds because you will not only need a VPN with good connection speeds and a decent selection of UK-based servers, you will also need one that works with the BBC iPlayer too. In recent times, the BBC has tried to stop people from using the iPlayer while connected to a VPN. Some, but not all, VPNs have found a way around this block, but you still have to be careful which ones you choose. 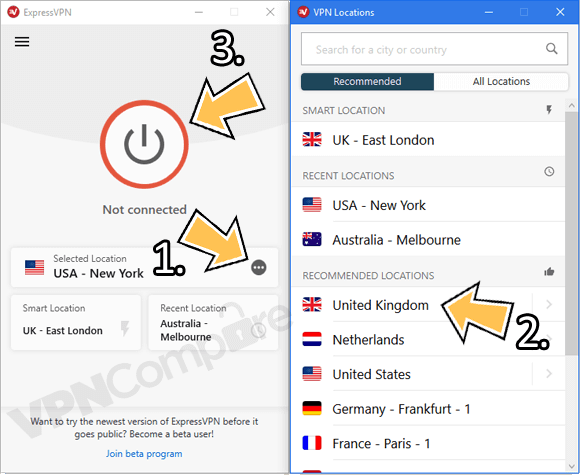 We have tested all the significant VPNs and found that ExpressVPN is the best provider for the job. They have a vast server network, lightning-fast speeds and with a 30-day money-back guarantee they offer terrific value for money too. Signing up for a VPN is extremely easy. With our top recommendation, ExpressVPN, it should take you no more than a few minutes. All you have to do is click on one of the links on this page and you will be redirected to the ExpressVPN website. Then take a look at the packages on offer to decide which is the best for you. We would strongly recommend their 12-month package which is nearly 50% cheaper than their monthly option and will also let you enjoy other sports and events on the BBC iPlayer and other streaming services. Once you have chosen your preferred package, click on it and then follow their simple on-screen instructions to subscribe. Once you have signed up with ExpressVPN, you will need to download their app onto your device. There are two ways you can do this. You can visit the Products section of their website and download the right app from there. This section of their site should automatically direct you to the right app for your device, but if for some reason it doesn’t just choose the app from the list lower down the page. If you are planning to stream SuperBowl LIII on a mobile device, your best bet is to visit the appropriate app store. Simply search for ExpressVPN and download the app directly from the app store. Once you have downloaded the ExpressVPN app, open it and log-in or activate it using the details provided when you signed up. After logging in, you will arrive on the app homepage. From here you will need to connect to one of ExpressVPN’s many UK-based servers. To do this, you should select Choose Location (1), followed by United Kingdom (2), and then finally press Connect (3). Once the app has connected, you will be able to log in to the BBC iPlayer either on their website or through the iPlayer app and watch every minute of SuperBowl action either live or on-demand. If you encounter any problems, disconnect and then try again with another UK server. There are lots to choose from and it shouldn’t take you more than a couple of tries to find one that works. When is the SuperBowl 2019 shown on TV? SuperBowl LIII will begin late in the UK. It is an evening event in the USA and so the action won’t get underway until the middle of the night UK time. The BBC will start broadcasting the event at 11.30pm GMT on Sunday 3rd February. If you are logging in from elsewhere in the world, be sure to check the time difference ahead of the event to be sure not to miss a moment of the big game. This year’s SuperBowl is to be held at the Mercedes-Benz Stadium in Atlanta, Georgia, home of the Atlanta Falcons NFL team. Who’s in this year’s SuperBowl? SuperBowl LIII is set to be contested by the New England Patriots and the LA Rams. For New England, it is their third successive SuperBowl. They lost last year’s showpiece event 41-33 to the Philadelphia Eagles but won the one before that against the Atlanta Falcons. They have the most SuperBowl appearances of any NFL franchise having appeared eleven times in the final. Nine of those appearances have come since 2000 during the legendary era of coach Bill Belichick and quarterback Tom Brady. For the LA Rams, it will be a first SuperBowl appearance since owner Stan Kroenke moved the franchise from St Louis in 2015. The franchise does have one SuperBowl victory under its belt; SuperBowl XXXIV in 1999. Their last appearance was in SuperBowl XXXVI when they lost 20-17 to the Patriots. Who to watch this year? Despite their claims to the contrary, just about every betting market has the New England Patriots as heavy favourites to win SuperBowl LIII. The odds are still relatively close on paper, but bookies have confirmed that the bulk of money being placed on New England. All eyes will be on their star quarterback Tom Brady once more. Brady is an NFL legend. He is the only quarterback with 200 regular season wins to his name. He has appeared in a record nine SuperBowls, won five and has won SuperBowl MVP on no fewer than four occasions. But not everyone will be cheering him on. Many were disappointed with his role in the deflategate scandal in 2016, while Harry Potter star Daniel Radcliffe has said he will cheer on the Rams after Brady was spotted with a MAGA cap in his locker. If you are going to be out of the UK, but don’t want to miss SuperBowl LIII, don’t worry. With a VPN you can still watch all of the action on the BBC iPlayer. ExpressVPN is our recommended provider and in this article, we have explained how to sign up with them, download their app, and get connected. Once you have done that, all that’s left is to sit back, crack open a Budweiser and enjoy one of the most exciting showpiece sporting occasions in the world, the SuperBowl. Ready to get a VPN? Try our recommended VPN service provider.